I struggled a little with this week's collage. I wanted to emphasize the "small" thyme leaves without them disappearing. I decided to keep the piece really simple. 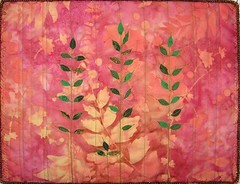 The background had enough interest on its own without much quilting and even though there is a lot of pink, it has the feel of Fall. Next week, will be the last of the "Seasons" themed weeklies and then I move on to the final four of the year with the theme of "A View from Space." I really like this one Kim...I'm really loving that background fabric. It's beautiful. Love the background too.